The tastes of the Byzantine people, with their fondness for luxury and splendor, were signally expressed in their art. However, it was not a mere emblem of sensuous delight. It was profoundly conditioned by the peculiar ideals of the civilization itself. For one thing, the strong undercurrent of asceticism prohibited the glorification of man; as a consequence, sculpture was not permitted to develop very far. The art which held the position of pre-eminence was architecture, and it had to be mystical and otherworldly. Furthermore, since the Byzantine civilization was a compound of elements both Roman and Oriental, it was inevitable that its art should combine the love of grandeur and the engineering talent of Rome with the gorgeous coloring and richness of detail characteristic of the Orient. this life, but to symbolize the inward and spiritual character of the Christian religion. It was for this reason that the architects gave little attention to the external appearance of the building. Nothing but plain brick covered with plaster was used for the exterior walls; no marble facings, graceful columns, or sculptured entablatures. The interior, however, was decorated with richly colored mosaics, gold leaf, colored marble columns, and bits of tinted glass set on edge to refract the rays of sunlight after the fashion of sparkling gems. It was for this reason also that the building was constructed in such a way that no light appeared to come from the outside at all but to be manufactured within. The structural design of Santa Sophia was something altogether new in the history of architecture. Its central feature was the application of the principle of the dome to a building of square shape. The church was designed, first of all, in the form of a cross, and then over the central square was to be erected a magnificent dome, which would dominate the entire structure. The main problem was how to fit the round circumference of the dome to the square area it was supposed to cover. The solution consisted in having four great arches spring from pillars at the four corners of the central square. The rim of the dome was then made to rest on the keystones of the arches, with the curved triangular spaces between the arches filled in with masonry. The result was an architectural framework of marvelous strength, which at the same time made possible a style of imposing grandeur and even some delicacy of treatment. 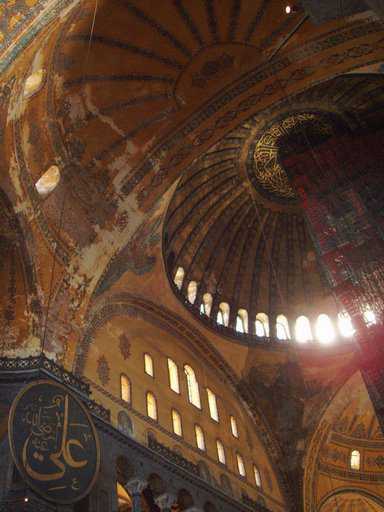 The great dome of Santa Sophia has a diameter of 107 feet and rises to a height of nearly 180 feet from the floor. So many windows are placed around its rim that the dome appears to have no support at all but to be suspended in mid-air. The other arts of Byzantium included ivory-carving, the making of embossed glassware and brocaded textiles, the illumination of manuscripts, the goldsmith's and jeweler's arts, and considerable painting. The last, however, was not so highly developed as some of the others. In place of painting the Byzantine artist generally preferred mosaics. These were designs produced by fitting together small pieces of colored glass or stone to form a geometric pattern, symbolical figures of plants and animals, or even an elaborate scene of theological significance. Representations of saints and of the Christ were commonly distorted to create the impression of extreme piety. The importance of the Byzantine civilization is usually underestimated. It was undoubtedly the most powerful factor in determining the course of development of eastern Europe. To a very large extent the civilization of imperial Russia was founded upon the institutions and achievements of Byzantium. The Russian church was an offshoot of the so-called Greek Orthodox or Eastern church, which broke away from Rome in 1054. The Tsar as the head of the religion as well as the state occupied a position analogous to that of the emperor at Constantinople. The architecture of the Russians, their calendar, and a large part of their alphabet were also of Byzantine origin. Perhaps even the despotism of the Soviet regime can be traced in some measure to the long-standing tradition of absolute rule in Russia which ultimately goes back to Byzantine influence. But the influence of the Byzantine civilization was not limited to eastern Europe. It would be hard to overestimate the debt of the West to scholars in Constantinople and the surrounding territory who copied and preserved manuscripts, prepared anthologies of Greek literature, and wrote encyclopedias embodying the learning of the ancient world. Moreover, Byzantine scholars exerted a notable influence upon the Italian Renaissance. In spite of the fact that the Eastern emperors eventually lost control of Italy, many of their former subjects continued to live there, and some others fled to the Italian cities after the overthrow of the Iconoclastic movement. The extensive trade between Venice and Constantinople in the late Middle Ages also fostered cultural relations between East and West. Consequently, long before the fifteenth century when eminent Greek scholars arrived in Italy, a foundation for the revival of interest in the Greek classics had already been laid. Likewise, Byzantine art exerted its effect upon the art of western Europe. Some authorities regard the stained glass windows of the Gothic cathedrals as an adaptation of the mosaics in Eastern churches. Several of the most famous churches in Italy, for example St. Mark's in Venice, were built in close imitation of the Byzantine style. Byzantine painting also influenced the painting of the Renaissance, especially of the Venetian school and of El Greco. Finally, it was the Corpus Juris of Justinian which really made possible the transmission of the Roman law to the late Middle Ages and to the modern world.